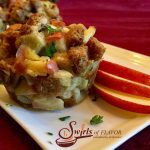 Studded with chunks of apples and flavored with fresh sage, Apple Sage Stuffin’ Muffins are not only delicious they’re also fun to eat! Shaped like a muffin and hand-held, you can guarantee that the kids will definitely eat the stuffing this year! Preheat oven to 350F. Spray 12-cup muffin tin with non-stick cooking spray. In large non-stick skillet melt butter over medium-high heat. Cook apples, onion, celery and sage until just tender, about 7 minutes, stirring occasionally. Remove from heat and stir in broth, stirring until mixture is completely moistened. Let cool slightly then stir in beaten eggs. Press mixture into prepared muffin tins, mounding up on top and dividing evenly. Bake 25 minutes or until set. Let stand on wire rack minutes. Loosen stuffin’ muffins around edges with a sharp paring knife and remove. Serve warm or at room temperature.